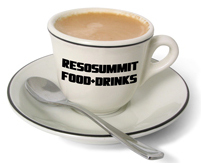 Looking for nearby restaurants, a caffeine hit or a brief escape from reso-madness while at ResoSummit? Are family members accompanying you to Nashville, where they will certainly want to find activities that don't involve the sound of 100 dobros? Here is a random list of possibilities to consider. We suggest calling ahead to confirm details; and send us an email if you have a suggestion for something to add or change on this page. This exhibit features stunning, hand-blown glass sculptures by renowned artist Dale Chihuly, on display throughout the botanical garden at Cheekwood. Wednesday through Friday, the Cheekwood grounds will be open until 10pm, specially lit for strolling, with each of Chihuly’s installations brilliantly illuminated for a unique and stunning nighttime art experience. Click on the image at right for more information. Cheekwood is a 55-acre botanical garden and art museum located on the historic Cheek estate, approx. 8- 1/2 miles southwest of downtown Nashville. A related exhibit is at the Frist Center for the Visual Arts, not far from Scarritt-Bennett at 919 Broadway. Open daily until 5:30pm, and until 9:00pm on Thursdays and Fridays. Click on the image at right for more details. Interview and performance: Marshall Chapman discusses They Came to Nashville. For her just-published book, They Came to Nashville (Country Music Foundation Press/Vanderbilt University Press), Marshall Chapman sat down with fifteen artist-songwriters to document their first journeys to Nashville. In compelling, often humorous stories, Mary Gauthier, Emmylou Harris, John Hiatt, Kris Kristofferson, Miranda Lambert, Willie Nelson, and others describe what drew them to Nashville in the first place, how they got here, and what happened to them when they arrived. In this publication celebration, Chapman discusses the book and performs songs from her new album, Big Lonesome. Following the program, Chapman will sign books and CDs in the Museum Store. Included with museum admission. Free to museum members. Click on the image at right for more details. The labyrinth, located in the International Garden at Scarritt-Bennett Center, is the only outdoor labyrinth in Nashville and is a replica of the 11-circuit Chartres Labyrinth, laid in the floor of the Chartres Cathedral around 1220. Click on the photo at right for more information about the labyrinth. Visit The Front Porch, Scarritt-Bennett's place for gifts, books & coffee, and Gallery F, a contemporary and outsider art gallery, located in the Ogburn House at the corner of 19th & Grant. Click on the logo at right for information about the current art exhibit at Gallery F: Eleven Visionaries and One Submarine: More Art Brut. This exhibit features paintings, drawings, installations, sculptures, text and video by artists who have had experiences with mental illness: one as a psychiatrist who worked with the mentally ill and the others who have experienced mental illness. Great exhibits, with many music and video clips and fascinating displays presenting the story of country music. Dobro geeks will be particularly interested in seeing Jerry Douglas's fabled R.Q. Jones instrument. The Ryman offers daily tours. Nearby, you'll find Hatch Show Print (poster gallery here); Gruhn's Guitars, and such classic bars as Robert's Western World. See above for information on the Chihuly exhibit currently at the Frist. A "Music in the Lobby" event every Thursday and Friday from 6-8pm offers live music, bistro food & drinks, and gallery visits. Paintings by Farrar Hood are on exhibit throughout October 2010.
offers several trails, ranging from easy to strenuous. Click here for a PDF trail map. 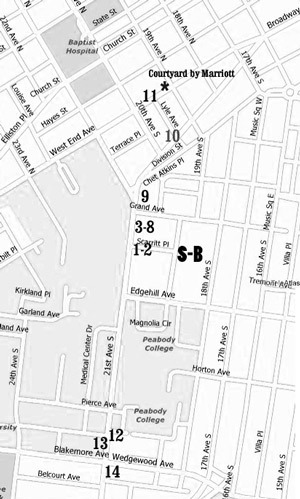 Scarritt-Bennett (S-B) is located between 19th and 18th Ave. South, with Edgehill on the south edge and Grand on the north edge. A short street, Scarritt Place, connects S-B on the western side (19th Ave. S.) to 21st Ave. South, where there are many restaurants. Some of these are listed below. You can also click on the link below the restaurant list for a Metromix "playlist" of restaurants near ResoSummit, with restaurant descriptions and an interactive map. Not on the Metromix map, but on 21st Ave. South near Grand, are a Starbucks and a Subway, and the nearby Japanese restaurant, Goten. "Nashville Originals" is a link to some finer dining options. Many of the restaurants listed below have vegetarian & vegan options; Betty is your go-to person for advice on veggie food options. See Playlist for restaurant descriptions and details. Highly recommended! Try the vegetarian platter with falafel, hummus, rice with lentils, tabouli. pizza, salads, hoagies, calzones; incl. Lunch M-F only, 11:30-2:30. Dinner nightly. Looking for something closer to fine dining? These independent Nashville restauranteurs are "dedicated to the challenge of sustaining the independent restaurant as a feature and a fixture of local culture and community." We haven't tried them all, but we like all the ones we've tried. Click on the "Nashville Originals" link below for restaurant details.